Anthony Whishaw, RA, held his first solo show in Madrid in 1956 and has shown since then across Britain and abroad, with numerous exhibitions in both commercial and museum spaces, including regular exhibitions at Roland, Browse and Delbanco, the London gallery co-founded by emigre collector, Dr Henry Roland. Whishaw was elected a Member of the London Group in 1979, an Associate Royal Academician in 1980 and a Royal Academician in 1989. Signed signed, bottom right: A.W. Whishaw’s work deals with explorations of memory and experience. Often on the edge of representation, varying in intent, scale and depiction, it seeks to reconcile illusion and allusion, teetering between abstract and figurative, and past and present pictorial languages to create unexpected visual experiences. 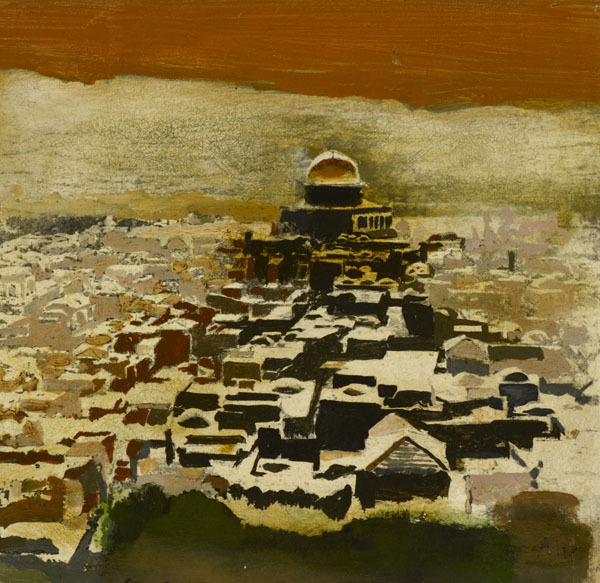 This striking interpretation of the iconic view across Jerusalem to the most sacred Muslim site, the Dome of the Rock is a more directly understandable work, creating an instantly recognisable image.